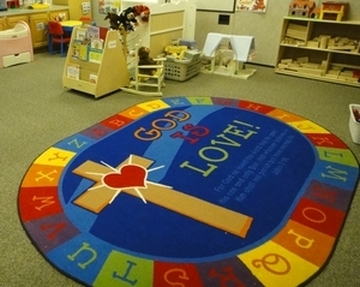 The St. Matthew Preschool provides a Christ-centered atmosphere conducive to the physical, emotional, mental, and spiritual growth of the whole child. A limited number of children age 2 by July 31 will be enrolled in the Tuesday-Thursday program only. Non-enrolled Lunch Bunch $15.00 per day, drop-in. Office hours 8:30 to 4:30 during the school year and abbreviated hours in the summer (please call before coming during summer hours). Enrollment for the coming year begins in February. Enrollments are accepted until classes are full. The State Health Department requires the children to be up to date on their immunizations. The parents must provide a signed medical form and a copy of the immunization record at the time school starts. The state requires an enrollment form and a parent responsibility form to be on file when the child starts. Children must be potty-trained and preferably wearing underwear. We do not have the facilities to change diapers. Provide Christian education in the classroom and chapel time, as well as on the playground and during center time. Provide a wide variety of developmentally appropriate activities to offer opportunities for children to explore individual interests and differences. Provide hands-on activities in a variety of learning centers so each child learns through the best style for him/her. Provide learning centers - writing, science, art, blocks, manipulatives, etc. - for the children to explore the many different themes used throughout the year. Provide a low student/teacher ratios at 7/1. Provide children with outdoor activities every day. Encourage children and their families to accept God's unconditional love as it is experienced through His word and the loving, caring preschool staff. Help pre-kindergarten children prepare for elementary school. Maintain ongoing communication between teachers and parents through newsletters, parent meetings/conferences and other parent involvement.